We’re three-quarters of the way through Swee’Pea and TheMonk’s kindergarten year. So much has changed in these past several months that it’s difficult to keep up. The biggest leap that the kids have made, however, is in their reading skills. The best, and admittedly worst, part of this is that bed time stories are now being read to me. Now, they don’t use the voices or bang out a Dr. Seuss rhyme like Maya Angelo, but they can downright read. Every night we pick out books like Harry the Dirty Dog, A Crazy Day at the Critter Cafe (a current fave), There’s a Wocket in my Pocket, Where the Wild Things Are and, most recently, Olympian and Dancing with the Stars winner Kristi Yamaguchi’s new book, Dream Big, Little Pig. We’ve been reading our books with Swee’Pea and TheMonk taking turns reading books or, sometimes, pages of the book. I only correct maybe 1 or 2 words per page. They blow right through the books. And, I have to say, after we received an advanced copy of Dream Big, Little Pig, Swee’Pea fell in love with it immediately. I have found her reading it to herself in the mornings and I even found her copying all the pictures of Poppy the Pig with her pink crayons. I must admit, the book is fun and we’re definitely a fan. We often talk about the meaning of the books we read and I try and reinforce the message through a brief discussion. The book, of course, is about finding what you love and doing it with all of your heart. Dreaming big is how you become great. For little pigs named Poppy or little girls named Swee’Pea. Mornings are a rush. There are showers to take, clothes to put on, breakfasts to eat, coffee to drink, lunches to pack, teeth to brush, hair to comb, shoes to tie and jackets to don. It’s like herding cats. Only these cats will spontaneously put their underwear on their head, whine about their food and generally move slower than this father would prefer. But, invariably, we hop out the front door between 8:00 and 8:05 a.m. each and every school day. And as we open the door and the cool air hits our faces, we hunker down for the short walk to the bus stop. It’s at this point that I know we won’t be late and we relax and enjoy the walk. Swee’Pea and TheMonk pull their little backpacks on wheels that is often filled with nothing more than a completed book list and that day’s lunch and snack. Along the walk we notice many things. We notice new gopher holes in our neighbor’s lawn, snails making a run for it across the sidewalk, newly fallen leaves, brightly colored trash and the occasional roly poly. But what I notice is how big my kids are becoming. Which is why, as we walk along in the solitude of the morning, I smile to myself when Swee’Pea reaches up to hold my hand as we walk along the sidewalk. Or when TheMonk continues to hold my hand after we cross our one and only street along the way. I smile because I know one day soon – too soon – my kids won’t want to hold Daddy’s hand anymore. Someday soon, I’ll have only the faint memories of holding hands smaller than mine and wondering where the time went. The cruelty of parenthood baring it’s teeth. Yes, I’ll try to hold onto these memories because someday it’s all I’ll have. Well, that and underwear on the head. When you have twins, you accumulate a lot of stuff. One of the areas that you absolutely have to buy more than one of is car seats. And then you have to buy them again. And then again. And, if you’re like me and my wife, since one of us dropped off in the morning and the other picked up, we needed to buy seats for both of our cars. When they were infants, we bought two carriers and four bases. But after they grew out of the infant carriers, we bought four each. And every time we bought our seats, we bought Graco seats. I felt like they were the best seats available and who wouldn’t want their children to be safe? But suddenly, we have quite a collection of car seats. And we naively thought we’d hold onto them so we’d have seats for another child, if and when that day would come. But we recently learned that car seats actually expire! So now we have two infant seats that we no longer can use and an infant rapidly approaching. Baby #3 is due to arrive in early June. We need to get an infant carrier. Do you think Graco has a buy 10 (plus a Graco Double Stroller!) get one free program? If anyone from Graco wants to help out a loyal consumer, I’d gladly accept! 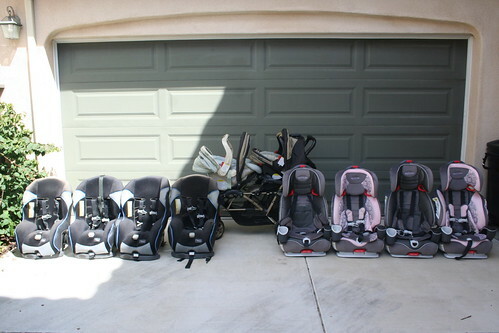 Our collection of Graco Car Seats and a Double Stroller.